The option lets you show customers discounts you are extending. It also lets you record how much of a discount, if any, a supplier has extended to you. 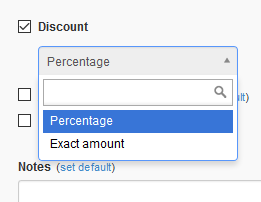 Selecting the Percentage option will add a Discount column where you will be able to enter the percentage. Choosing the Exact amount option allows you to enter a fixed amount. Although the checkbox activates the column for the entire form, discounts must be entered line item by line item.